HMV is planning on opening specialist gaming centres in its Manchester store before Christmas 2008 with up to eight further centres planned for other UK stores over the next 12 to 18 months, according to a HMV spokesperson today. The news follows the announcement that HMV has acquired state-of-the-art multiplayer gaming company Gamerbase Limited, the company that has run its gaming centre in London's Trocadero store in Piccadilly Circus since December 2007. 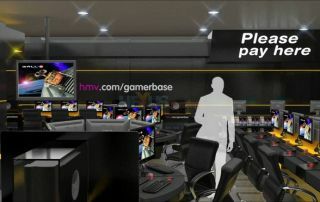 HMV's new retail concept provides customers with a 'try before you buy' opportunity to sample new console or PC games. The first centre outside of London will be HMV's Manchester Market Street superstore, set to feature over 50 player units over an impressive 2,000 sq.ft. It's due to open in time for Christmas. Gamerbase's co-founders Dominic Mulroy and well-known multiplayer gaming champion Sujoy Roy, will be kept at HMV in a senior managerial capacity. "We're delighted and excited to bring Gamerbase into the HMV fold," says Mulroy. "Gamerbase is passionate about enabling gaming enthusiasts to enjoy a premium-quality experience, while also offering customers the facility to purchase the very games they are playing directly from the store. We believe this development provides an excellent platform for HMV to connect with customers they may not always have reached in the past." "We've been developing our games offer in a number of ways, and we see instore gaming as an important strand in our overall strategy," says HMV's Head of Games, Tim Ellis. "Where we roll them out, we'll be looking to locate the Gamerbase centres next to our games departments to bring the whole offer together for our customers - so if someone's enjoyed playing a game online, they can pre-order or purchase it there and then." HMV MD Simon Fox noted that the move was part and parcel of HMV's 'get closer' strategy "to continually improve the in-store experience for our customers - establishing our stores as multi-channel, interactive destinations and bringing to life the product that they're so passionate about." Crikey. And we thought it was just a record shop! HMV is looking to open further gaming centres in Edinburgh, Covent Garden, Oxford Circus, Southampton, Liverpool and more. Gamers can pay-to-play, buying up three hours of gaming time (which they can use up any time they like in smaller time-chunks) at a cost of £10 for three hours, with promotions with publishers on launches planned. More details as and when we get them. Meanwhile, the massive gaming centre that was Omega Sektor in the centre of Brum is no more. It seems that particular gaming centre was perhaps a little bit too ahead of its time, having now gone bankrupt. Hey ho!